You know you're in good hands when you're in master hands. 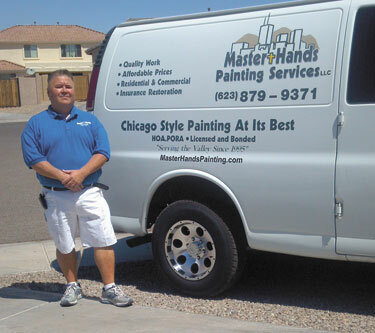 John M. Gonzalez of Master Hands Painting has not only conveyed a sense of excellence to his clients, he's also instilled such confidence that 99 percent of new customers come from referrals! But it's not only about monotone interior and exterior painting. Check out masterhandspainting.com for some creative concepts – stripes and polka dots are sure to add pizzazz to any wall! Gonzalez, who has been painting – Chicago-style – for 30 years, has a full menu of services. He'll do epoxy floors, wallpaper removal and/or installation, power washing, drywall repairs, and generally any other handyman service like recoating old bathtubs. "Right now, cabinet refinishing is taking over," he added. Gonzalez will even tackle furniture refinishing. Just ask, and if it's not something he and his team can do, he's got a host professionals to recommend. "I'm a perfectionist at what I do," Gonzalez offered. "Many people say they are a jack-of-all-trades and a master of none, but I say I am a jack-of-all-trades, master of ONE. And that's painting." In addition to having earned his stellar reputation with superior workmanship, Gonzalez has some clever tricks up his sleeve. When he refinishes front doors, he uses varnish with a UV protector in it. Homeowners can't believe the difference it makes in cutting down heat. It's no wonder Master Hands Painting has been endorsed by the coveted Angie's List. Call John Gonzalez directly at 602-486-3093 for a consult. Currently, he's offering a great deal of painting a standard sized room in a satin finish for $200! SCOTTSDALE – At Z-Weight Loss, they want those who are seeking to lose weight to know that as of Dec. 6, 2011, the FDA has prohibited the sale of OTC and "homeopathic" hCG and declared it fraudulent and illegal. As they say, don't try this at home! Give the professionals at Z-Weight Loss a call, being confident they only use medical-grade and doctor-supervised hCG. Z-Weight Loss client Vanessa Clark is well aware of the value and effectiveness of using REAL hCG; she's been a satisfied and slimmer customer for over two years. "They are amazing and I highly recommend them," she enthused of the team at Z-Weight. 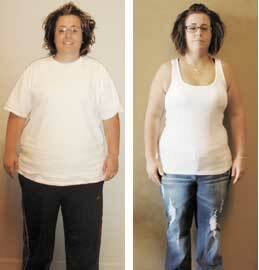 One aspect that proved lifesaving to Clark was the required medical exam prior to using hCG. "Dr. Vesco noticed my neck was swollen and said we couldn't begin the program until I had it checked out." A faulty thyroid was diagnosed, resulting in surgery! Since she attributed her symptoms to carrying a few extra pounds, Clark would have gone untreated had she simply tried to buy the now-banned over-the-counter hCG. "I'd rather spend a little more to do it the right way," she said of losing weight. Of shedding a pound a day she offered, "It's more of an adjustment and requires dedication more so than being hard." Clark opts for the hCG injections rather than liquid under the tongue. "The needles are tiny and don't hurt." And appointments are easy to make at Z-Weight. "I can normally call and get in the next day," she explained. Curious? Call Z-Weight Loss at 480-570-9200 to learn more or schedule a pre-hCG plan exam. Leaked Pacific trade pact exempts foreign firms from U.S. law? "These new trade agreements will place domestic U.S. firms that do not do business overseas at a competitive disadvantage. Based on these leaked documents, foreign firms under this trade pact could conceivably appeal federal regulatory and court rulings against them to an international tribunal with the apparent authority to overrule our sovereignty. If foreign companies want to do business in America, they should have to follow the same rules as everyone else. No special favors. "It is telling that the only apparent way these Pacific nations will enter a free trade agreement with the U.S. is if they are exempt from our onerous environmental and financial regulations that make it cost-ineffective to do business here. Instead of making these foreign firms exempt from these burdensome rules, they should just repeal the regulations and make it cheaper to do business here. "This poses an even wider problem, though. Obama is negotiating a trade pact that would constitute a judicial authority higher than even the U.S. Supreme Court that could overrule federal court rulings applying U.S. law to foreign companies. That is unconstitutional. The U.S. cannot be allowed to enter a treaty that would abrogate our Constitution. "This tribunal needs to be removed from this agreement, and no foreign company doing business on our soil should have a competitive advantage, created by some a dumb agreement, over American companies. What is Obama thinking? He is placing international organizations above the interests of our own country." “Angels For Life, LLC,” an in home Senior care company, treats Seniors with dignity, provides them with hope and offers them a view of a brighter day through life’s journey. Care givers are trained and State certified. Free in-home assessment. 8912 E. Pinnacle Peak Rd. S.619. Call 480-306-5021 or e-mail angels4life60@aol.com. You like Feta, couscous, hummus, some mousaka, or suvlaki maybe? Saba’s Mediterranean (located in The Galleria on Hum Road in Carefree) is the place to go in the North Valley for authentic Middle-Eastern fare that will make your taste buds sing with delight. Clip coupons and find specials in their ad in this issue. Call 480-575-6574. Out West Quality Upholstery & Interiors for Your Hacienda offers a complete design studio plus staging services. “The Entire Furnishing Boutique” with Designs by Beverly Sexton. All handmade furniture by local craftsmen. 38252 W. Jacqueline Drive, #C, Cave Creek. Call 480-575-8000 or e-mail outwestaz@gmail.com. Call Penguin Air Home Air and Heating Services 24/7 – they’ll get there fast! Complete system installed for as low as $2,995. Free estimates. Financing available. See their ad for great deals on tune-ups and service calls. Call 480-422-9559 or visit PenguinAirAZ.com. Call Bodyworks by Adrienne Bourchard, L.M.T. for Mobile Massage Therapy. Adrienne offers deep tissue, trigger point and lymphatic massage. Call 480-227-4513 or e-mail adriennebouchardaz@gmail.com. Office location: 6042 E. Valley Way behind Cave Creek Coffee Company in Cave Creek. Clip the coupon in the Priceless Plumbing Bulletin Board ad and get $25 off any service! For all your plumbing needs – they sell and repair water softeners, water heaters and misters, repair slab leaks and perform septic inspections. Call 480-567-2395 today. Arizona Wildlife Control offers free estimates for snake removal and prevention, bird/bat control, pack rat removal, furbearing animal control and more! They are licensed and insured. Call 602-618-0284 or visit them at ArizonaWildlifeControl.com.